Cut day continues for Zuffa, LLC. 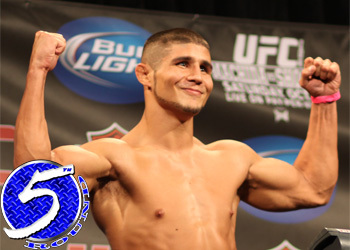 According to MMAFighting, Joe Stevenson has been released by the UFC. It’s not as though the company didn’t give “Daddy” every opportunity to stick around, as they finally decided to show the 29-year-old the door after he lost his fourth consecutive scrap. Most fighters get handed their pink slip after three straight losses. Winner of “The Ultimate Fighter 2” back in November of 2005, Stevenson posted a mundane 8-8 record for the world’s premier mixed martial arts promotion. Outside of winning the TUF 2 tournament, Stevenson’s biggest bright spot was his UFC 80 title fight against BJ Penn. Although he was submitted by Penn in the 2ndRound for the vacant belt, rattling off four wins in a row to earn the lightweight top contender moniker is something to be proud of. He was most recently seen posting a lopsided unanimous decision loss to Javier Vazquez at “UFC Live: Kongo vs. Barry.” The June bout marked his featherweight debut.